This has been a cold winter here in Atlanta—and it’s not over yet! A month or so back we got the most snow that I’ve seen in Atlanta in twenty years. 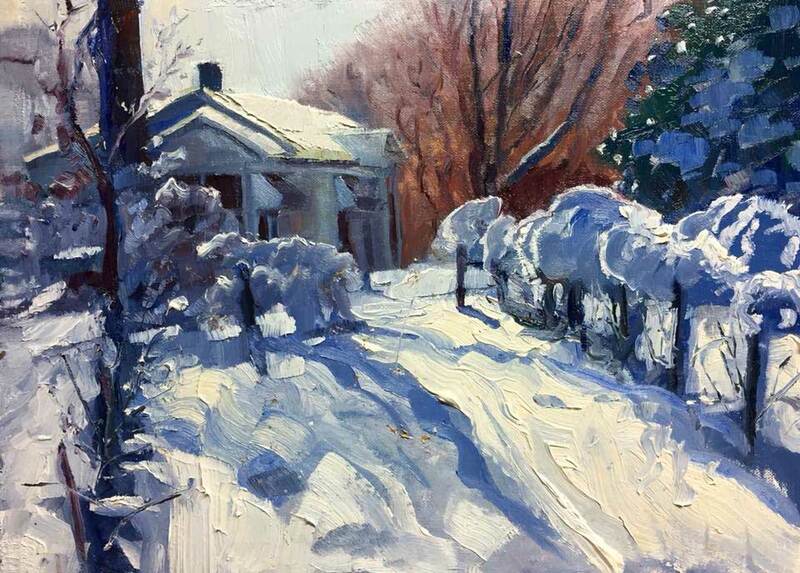 Everyone stayed shut up in the house waiting for it to melt but I was so excited to paint real honest to goodness snow that I spent two days walking up to Mabry Farm from my house in two feet of wet snow and painting as much as possible. 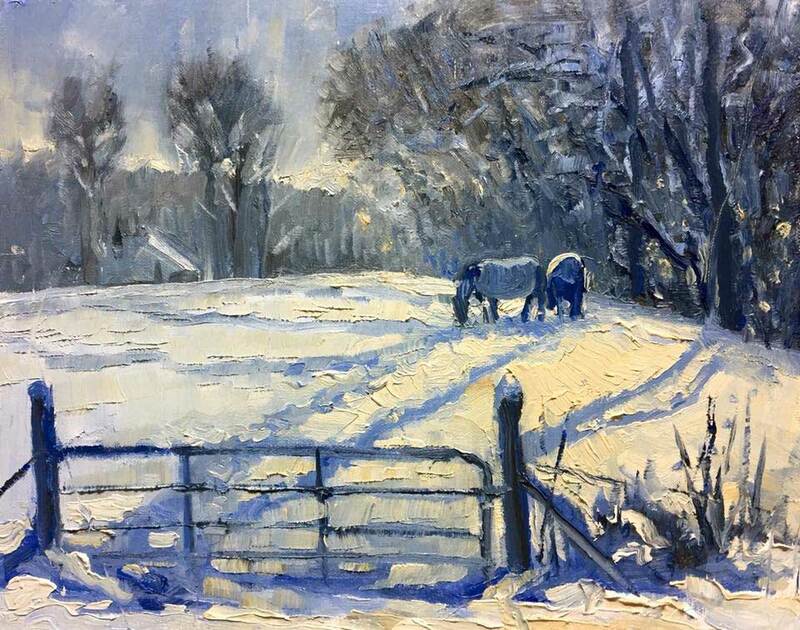 The first painting is a small 8 x10″ of one of the trees in the lower pasture covered with snow. It was early and very cold and new snow was still blowing around when I set up it —wonderful! No one would ever suspect this image came from anyplace in Georgia. 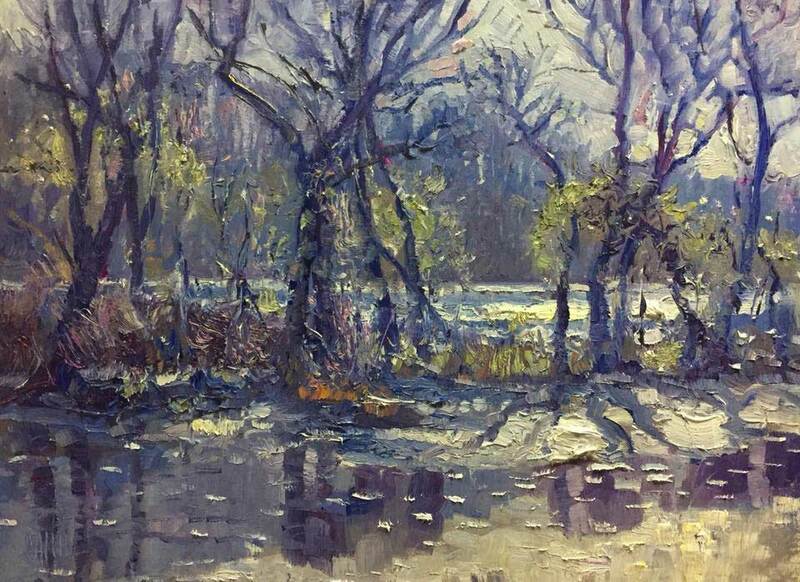 I used a very limited palette of White, Ocher, Ultramarine Blue and a special color —French Earth, a very warm grayish green. 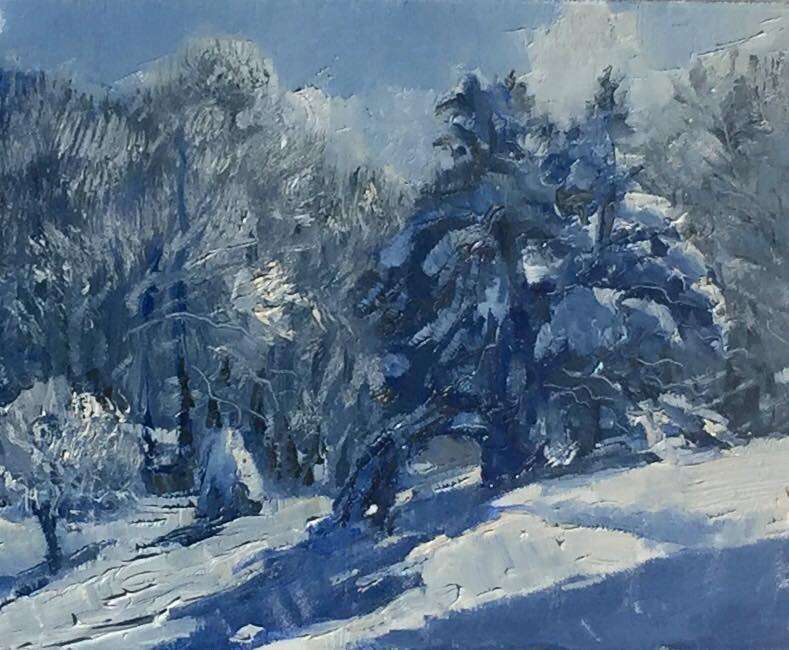 I’m not real fond of painting small paintings but I liked the way this one worked out and eventually used it for our Christmas card. 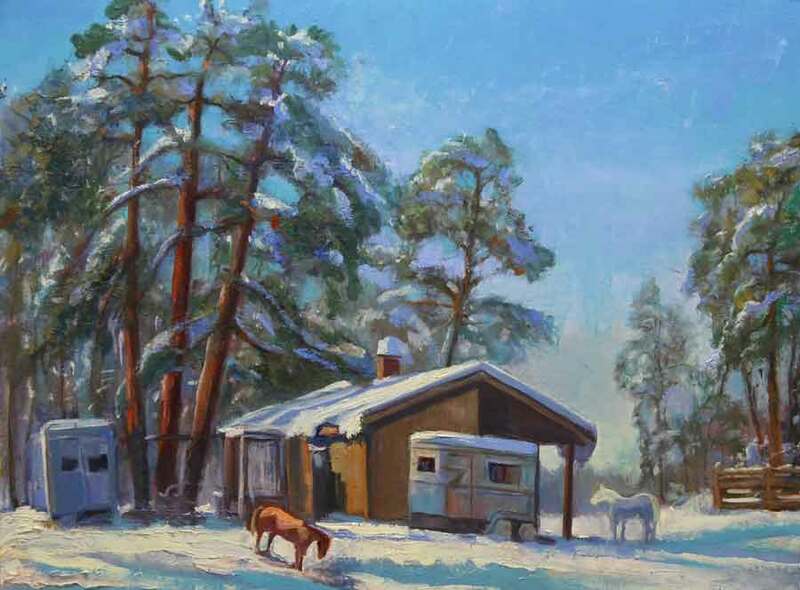 The next two paintings I painted on the same day concentrated on the horses, all dressed in coats for the weather. The larger, a view of Levada’s barn and the pine trees covered with snow. I did some work later to this painting in the studio—usually not a good idea. 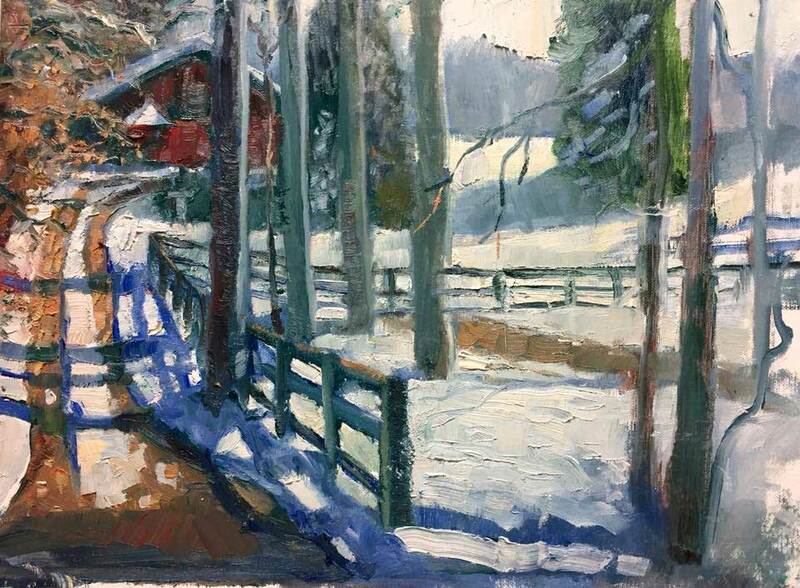 The next day I was back over to do a view of the thawing driveway up to the Mabry’s tomato red barn. I was pleased by the composition and when I was done I broke everything down and headed back out to the pasture to see what I could do. Laying the fresh painting on the crusty snow to dry a bit I got busy on another—to my surprise when I turned back I noticed one of the horses licking the fresh paint off the board—A huge smudge right in the middle of the painting! Well, I chase him off and had no other choice but to break everything down again and return to the mornings spot and repaint it. Later in the day I found a fresh batch of virgin snow in the middle of the muscadine vineyard on the other side of the farm. By this time the light was perfect and I was able to capture those beautiful blue shadows as they cast off the vines and the small white house on this section of the property. 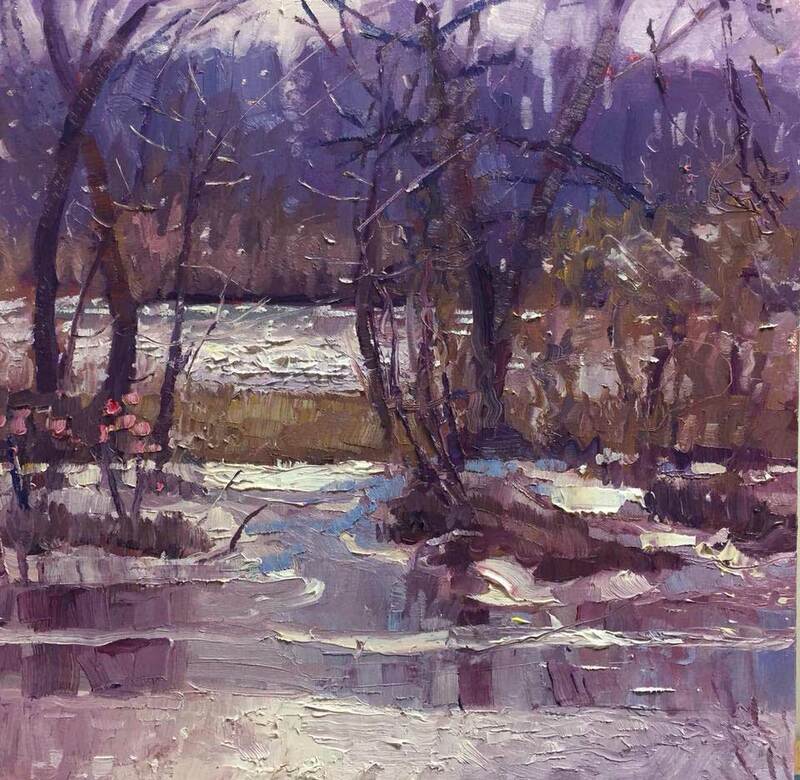 Everything quickly melted but it remained cold and after the new year I was back over to the river and pleasantly surprised to find ice and snow along the shores of the marsh and river. It’s very interesting in this one section because a small creek flows parallel to the main river and you can see through the trees—now devoid of leaves to the other side. So you get a nice background blue and several layers in front with trees and brush and more water. Of course I’ve done dozens of painting here but the snow and ice really changes things up and made it look all new. I just love this area for it’s constantly changing color and light. Fun meeting you Sunday. Congratulations on your big award. I did think it was a terrific painting while I stared at it during the judging. See you next year if I don’t see you out painting sooner!